Carlsbad, CA. – In the battle of Olympic 5000 meter silver medalists, Ethiopia’s Dejen Gebremeskel who won silver in London 2012 took on America’s 2016 Rio silver man, Paul Chelimo in the 32nd Carlsbad 5000, dubbed “The World’s Fastest 5K”. Competitor Group matchmaker Matt Turnbull and I mounted the press truck while our intrepid camera man Rich Jayne clung to the back of the lead moto. Here is how the race played out on a perfect Southern California day. Carlsbad, CA. – The 32nd running of the World’s Fastest 5K took to the roads of Carlsbad, California yesterday. Competitor Group’s elite athlete coordinator Matt Turnbull and I took seats on the lead vehicle while Rich Jayne manned the lead camera. Here’s how we called it. Beyond pure competition the beauty of racing lies in the absolute of distance in relation to the inarguable measure of time. 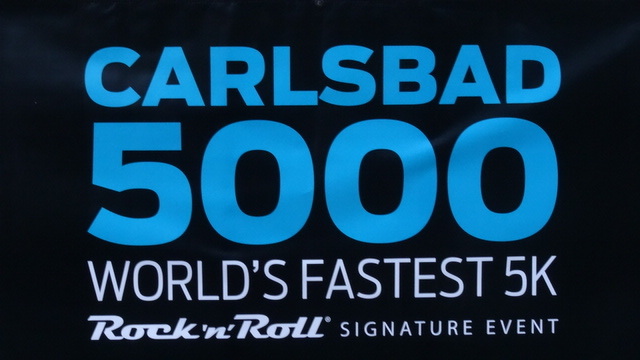 This weekend marks the 31st running of the Carlsbad 5000, billed, as always, as the World’s Fastest 5K. And while that subtitle still holds true, as 16 world records, 8 U.S. records, and a laundry list of age-group marks have been set on the tranquil seaside course, it is true mostly in regard to potential for national and age-group marks, rather than the world bests. Since Kenya’s Sammy Kipketer reeled off his two 13:00 wins in 2000 and 2001 — both years featuring sub-4:00 opening miles — no one has come within a javelin throw of his mark. Last year on a newly designed layout Tucson-based Kenyan Lawi Lalang took the title in 13:32, equal fourth slowest winning time in Carlsbad history, and same as Steve Scott’s inaugural year win in 1986. U.S. master phenom Bernard Lagat finished third overall in a new world master’s record 13:40 (behind little known Wilson Too of Kenya, 13:35). Lalang, an eight-time NCAA champion while at the University of Arizona, is back to defend in 2016, again taking on his training mate Lagat. The two will test their mettle against American mile standout Will Leer (fourth in 2013, 13:36), two-time Australian Olympian Collis Birmingham, and Great Britain’s Andy Vernon who set his road 5K PR in Carlsbad in 2012 at 13:40.